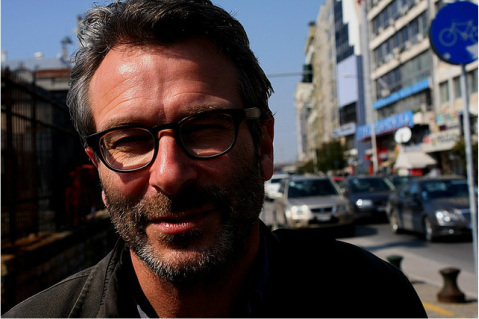 Jon Henley is an award-winning British journalist, writer and broadcaster. He is currently a senior feature writer with The Guardian in London where his work focuses on international reportage, but also includes analyses, investigations and interviews. You can find his Guardian profile and collected articles here. Jon was The Guardian's chief correspondent in Paris for nearly 10 years and has reported for the paper from more than 30 countries – datelines as diverse as Reykjavik, Kabul, Rabat, Cayenne, Hobart, Freetown, Dubai, Marseille, Pristina, Rovaniemi, Thessaloniki, Naples, and Barcelona. Recently he has won widespread recognition for his innovative use of social media in reporting the impact on ordinary people of the economic crisis in southern Europe – there's a short video about that here. Jon also wrote the Guardian's groundbreaking, multi-award-winning multimedia interactive Firestorm, and told the full story of the fire that tore through a small Tasmanian town – and of the catastrophic impact of climate change on bushfires in Australia – in an accompanying ebook. Hailed as a landmark in longform digital storytelling, Firestorm has been selected for official competition at documentary film festivals around the world. It won the 2013 Walkley Award for multimedia storytelling and was instrumental in the Guardian being named UK Newspaper Website of the Year..
Jon's work has been shortlisted for numerous other national and international awards, including Feature Writer of the Year in the British Press Awards and, for Greece on the Breadline, Best Digital Innovation in the UK Foreign Press Association awards. Jon Henley grew up in Middlesex and studied French and German at university; his first job in journalism was as a staff reporter at the Associated Press news agency in Amsterdam. After freelancing in assorted European countries for news organisations including The Guardian, the International Herald Tribune, Reuters and the BBC, he was appointed The Guardian's Paris correspondent in 1997, finally returning to Britain after almost 20 years abroad in 2006 (there's an article about what that was like here). A fluent French speaker, Jon is a frequent commenter for French radio and television, including France Inter, France Info, France Culture, RFI, France 2, France 3, TV5 Monde, Arte and France 24. He co-wrote and presented The Price of Property, an "excellent" (Daily Mail), "button-bright" (Radio Times), "absorbing" (Metro), "intelligent" (Time Out) and "thoughtful" (Guardian) series of four one-hour documentaries on Channel 4 that prompted the television critic of The Times to describe him as "bright, engaging, likeable ... the anti-Piers Morgan".